Developing the skills and education as a firefighter requires constant evaluation and learning from different sources. Learning from the experiences of others is a good way of learning from others successes and challenges. This case study was graciously shared by the firefighters of the Citizens Fire Company in Charlestown WV. The transparency of their members in discussing this challenging fire was inspiring. The aim of this case study and accompanying audio interview is to share the lessons learned from this Heavy Content Fire to help other departments understand the challenges faced that day and how to better prepare for Heavy Content Fires. Review the incident information and discuss the affects of Hoarding. Focus your efforts on how the clutter, confusion, and persistence of the on scene firefighters lead to a successful outcome in challenging conditions. Discuss how building construction, fire volume, cluttered conditions, and hazards can lead to danger. Listen, read, and then apply the lessons learned to your operational methods to have a better understanding. As you look into the basic physics of fire there are three elements needed to support combustions (burning): heat, fuel, and oxygen. Out of the three elements needed, one of these has a heightened level of importance when you are fighting fires in heavy content conditions. Would it be the heat? There is a noted presence of heat and it can be reduced. However,will you have the opportunity to remove enough of the heat, could you stop the burning process, so it's not heat. Consider the fuel, if the firefighters are able to remove the cluttered items from the burn area, would that extinguish the fire? If that process is ineffective then we know it is not fuel. That leaves air, it must be the air! To understand the importance of air in the heavy content fires, consider structures that are loaded full of belongings from years of collecting and how they will provide endless amounts of fuel. In fact, many of these fires have enough fuel to burn for days. By considering fire tactics that eliminate heat and fuel and realizing how difficult they can be, it will allow the focus to fall directly on the available air. Air can have a huge influence on fire growth, but in hoarding conditions it most often is the variable that has the most influence. The amount of air available will determine if the fire will progress to decay or progress into the growth phase of a fire. There are so many scenario's to consider in heavy content fire, but for the purpose of this article consider that there was a fire in a sealed basement or home that had fully functional windows and doors. In that situation, the amount of air could be minimal; depending on what doors might be open, the level of clutter, and the location of the fire. These variables could affect the how long a fire could burn without being discovered which would give the fire enough time to cause significant damage to floor and roof joists as well as floor decking. Add in the weight from the clutter and a pending collapse could be near, again all of this could happen before the fire is discovered. Taking the time to study and understand theses variables will give firefighters a better knowledge of the added dangers posed by extreme clutter and prompt a more thorough size up. Being aware of these three variables when you arrive to a reported structural fire and seeing that the property has the external signs of hoarding (such as cluttered yards), officers need to investigate for signs of extended burn times. The best method would be to do a thermal imaging 360 size-up to discover the hottest parts of the structure while also indicating where the coldest area's are located, keeping in mind you are looking to see where the fire is presently and where it will go if you give it air. Finding fires in the decay stage should raise suspicion of an extended burn time, while finding a fire well into the growth phase could indicate a ventilated fire. Both of these findings could indicate extended burn times. Just because the fire has progressed into the growth phase does not indicated shorter burn times. It indicates that the fire has found an air source. Without control of the air, loss of multiple windows or the inability to close doors, firefighters should set up for defensive operations that employ large caliber streams placed outside the collapse zone. Heavy Content conditions that are feed with large amounts of air will progress quickly. Often surpassing the GPM of standard sized handlines. If these variables are uncontrollable firefighters should assume the fire will continue to intensify even if handlines are in place. Utilizing corners of the building to place apparatus, stream reach, and hose lengths will keep firefighters away from the dangers of collapse or overgrown trees. It will also give a area of refuge if the yard is full of clutter and the fire extends to that clutter. Fire extending to yard clutter can rapidly spread across the tops of the stacks as it will have all the air needs. Wind conditions can cause this horizontal spread to reach speeds faster than firefighters running in turnout gear. It is essential for firefighters to pay close attention if the fire extends into the yard and perform a quick retreat to prevent this potential disaster. Controlling the air is essential when battling homes with unlimited amounts of fuel. Having control can allow for a rescue or interior push, while not having control is a indicator of defensive operation until enough water can be applied and/or air control can be established. 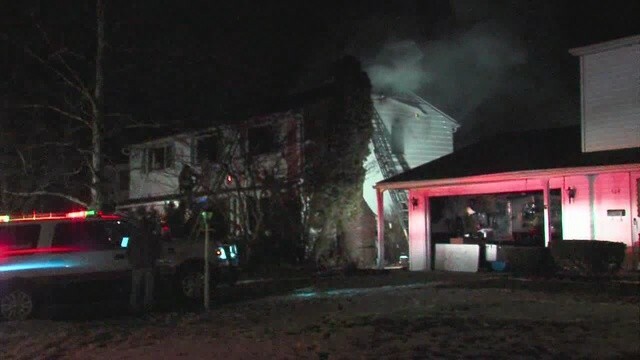 Approximately 1600 hours on January 18th the Elyria Ohio fire department was alerted to a house fire. The initial dispatch was directed to an industrial area with a large warehouse structure and first arriving unit advised nothing showing. Updated dispatch information redirected the responding units to the correct address and also advised the responding chief of confirmed occupant trapped. Dispatch also passed along information from the caller that the occupant was a “Hoarder”and they could see visible flames. Engine 3 arrived on scene with smoke showing throughout the structure with the heaviest amounts seen from division 2. Engine 3 chose and offensive posture with 1 3/4 sized line for primary search and fire control. Ladder 7 advised heaviest fire division 2 side c while chief 3 instructed them to ventilate vertically. Rescue 31 directed for occupant search and rescue. Supply line was established by engine 4. An unknown unit advised chief 3 of an awning that is compromised by fire with “a lot of trash underneath it”. Upon hearing that report Chief 3 ordered an emergency manpower recall. Shortly thereafter Chief 3 was advised fire was extending to upper floors and roof. A transitional attack was used after the discovery of fire extension the roof area. Chief 3 then requests a MABAS box alarm assignment 1341 to respond and stand bye. Second due company advised they were unavailable due to another assignment. Chief 3 then advised the box would be sufficient without them and requested the fire prevention and training officer to the seen. Shortly after that transmission unknown member advised the chief of fire on side C “coming through the vent hole”. At the 20 minute mark Chief 3 described their operation as a “marginal offensive attack”having difficulty making entry and are unable to locate the victim. Chief 3 a then advised of heavy fire in the awning area again. Additional units began to respond from the call back. At the 40 minute mark Chief 3 announced that they were going defensive due to the amount of stuff inside. Initial alarm assignments chose and aggressive interior posture for search and fire control. These crews were met with hoarding conditions with pathways as means of traveling between rooms. There initial tactical objective was to search the upstairs of the home, where they believed the occupant was located. What they found in the process of making entry to division 2 (the upstairs) is that it was full of belongings with no pathways. Upon this realization the crews began to use VES procedures (vent, enter, search) to gain access to the rooms via outside windows. During this process firefighters had to remove multiple tress to gain access to the windows. They chose the oriented search as ways of positive location management, due to the walls being unusable for orientation. Firefighters also began to search on the first floor where one truck company captain described conditions changing from moderate to severe in a shorter than normal time period. He also describe the stacks being so high at one point his “air pack was dragging the ceiling.” With the combined efforts of fire control and search proving to be ineffective Chief 3 ordered all firefighters out of the building and into a defensive posture. Once out of the structure Chief 3 requested an excavator to the scene for building demolition and to search for the occupant. They were able to locate the victim, under debris, on the first floor. The victim had the house so full of belongings that she could no longer use the second floor and had retreated to the first floor for day to day living. Overhaul and building demolition continued for hours and the aftermath is beyond words. 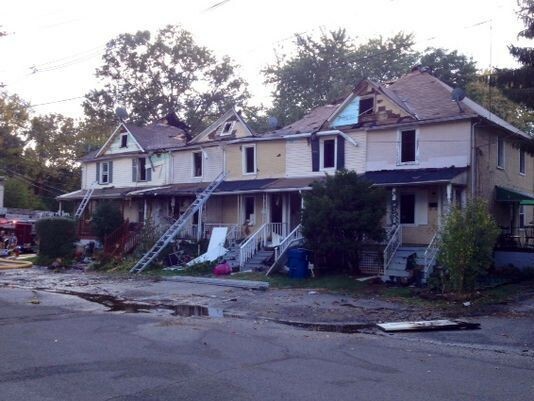 The fire that occurred in Elyria Ohio is a remarkable case study of success. While the occupant was not saved the operations used sound fire ground practices and aggressive procedures to contain the fire and preform a search. Risk versus reward was constantly used and communication was affective during the entire operation. One of the biggest learning points from this particular fire is the incident commander and his control over the fire scene. By effectively communicating with the operational firefighters everyone understood their assignments, performed accordingly, and came home safe. Very few suggestions for improvement are seen from the operational standpoint, but more towards having a common reporting system that can lead to affective pre fire planning. WRIGHTSVILLE, Pa. —Six adults and one a child are out of their home after fire through it Friday morning in Wrightsville, York County.The fire started in a basement laundry room around 4:30 a.m. at the home along the 500 block of Walnut Street between 5th and 6th streets. The homeowner told News 8 that he tried to fight the fire with an extinguisher, but the flames were too much. The state police fire marshal is investigating, but because damage is so extensive, the cause is not yet clear. Firefighters said the blaze was difficult to fight due to hoarding conditions in the basement. Albuquerque firefighters say six cats died in a house fire Sunday morning. The incident happened around 11 a.m. on Alder Drive NW near Unser. The homeowner wasn't injured, but she did lose six of her cats. Another five were taken to the veterinarian. The Albuquerque Fire Department says the fire was contained to one room and extinguished quickly. But what they found inside the home appalled them. "This was a hoarding situation. Lots of garbage and feces on the ground this fire could've been much worse because of all that extra fuel in the house," said Larry Gallegos, Bernalillo County spokesperson. "You don't normally have that much fuel, papers and boxes stacked up so high. All of that is fuel for fire that's what makes it so dangerous." According to Bernalillo County Animal Care ordinance, in most cases, residents are not allowed to have more their four animals in their home without a permit. Albuquerque fire said two of her cats are still roaming the neighborhood. If you see them, call animal control at 311. In this audio Chamber of Hoarders Ryan Pennington interviews Battalion Chief David Brosnahan. David has taken suggestions learned from Hoarder Homes: Piles of Hazards for Firefighters presentation and apply them to his departments operation. In this audio recording Ryan and David talk in detail about the Roseville's hoarding reporting system. Since it's inception Roseville's reporting system has identified 25 structures that exhibit some level of hoarding. Using this system on non fire situations allows crews to identify these buildings and begin to identify occupancy, access routes, structural stability, and stretch locations. A firefighter was injured in a two-alarm fire Tuesday at a condo complex in Dunellen, New Jersey. The blaze began at about 11 a.m. on Pulaski Street near the intersection of South Avenue. One firefigher suffered smoke inhalation and was taken away by ambulance. He is in stable condition at Robert Wood Johnson Hospital. Firefighters had a tough time battling the fire because in the apartment where the fire started, it was a case of what some are describing as hoarding conditions. It was so difficult getting into the apartment that firefighters had to fight it from the outside. dealing with the affects of compulsive hoarding disorder. The ChamberofHoarders.com is a website dedicated to teaching educating first responders on the needed changes to tactics and challenges they will face when entering the hoarding environment. From bio-hazards during a medical response to a working structural fire hoarding offers dangers that can affect responders for years. 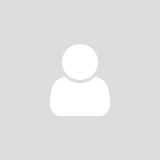 The mission of this website is to deliver actionable content that you can put to action immediately. Starting with this post we would like to walk you through the causes, challenges, and solutions when dealing with the conditions caused by compulsive hoarding. Over the next 52 weeks we will be posting fresh content that offers insight into the disorder and how to change our operations to bring everyone home safe. Compulsive Hoarding Disorder is defined as the accumulation of and failure to discard a large amount of belongings that have no apparent value, the accumulation makes living spaces unusable, and causes significant distress on the occupant (Frost and Hartl 1996) This clinical definition describes the inability to discard belongings that eventually accumulate from floor level until, eventually, ceiling height. Compulsive Hoarders receive positive feelings from the acquiring belongings and are unable to part with them because of the negative feelings they receive when parting with them. These items can differ in each case of hoarding, depending on the afflicted’s compulsion. It’s believed that Compulsive Hoarding Disorder affects between 700,000 - 1 million people. (Hoarding Handbook… Bratiotis,C, Steketee (2011) Many think that this number is lower than the actual number. 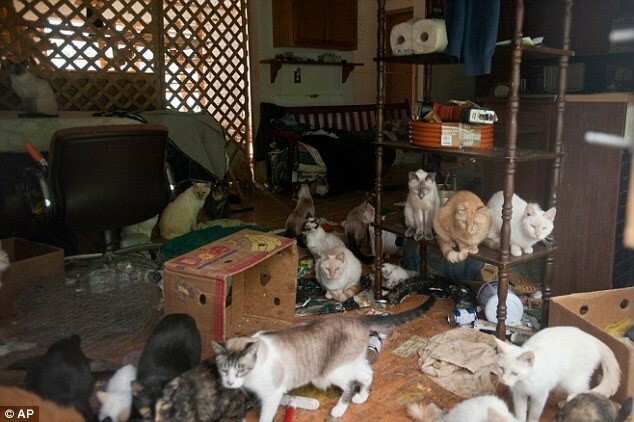 Many cases of hoarding go unreported as the affected person often feels ashamed or embarrassed by their disorder. They don’t want “discovered” or “exposed” and often stay hidden inside their homes without allowing anyone to enter, including family members. Not allowing visitors inside will often keep the conditions hidden until an emergency happens and we, the first responders, find the conditions as we make entry to solve the problem. Dealing with surprise can be one of the biggest challenges to first responders. Imagine responding to a seemingly normal looking home, just to open the door and find a labyrinth of belongings that reach to the ceiling. Most often the hoarding is discovered during a routine emergency medical call or fall assist. If you discover these conditions during one of these types of responses you need to start the pre-fire process in motion to establish a “Heavy Content” environment. Getting the information should be processed through your departments normal pre -fire planning process for constancy. Adding the plan to the normal collection of multi-family and high hazards buildings will make the plan available to the street level responders. Having an understanding of the complexities associated with Compulsive Hoarding Disorder is required by the responders left to deal with the mess. It is a complex disorder that is NOT A CHOICE. We can not cast judgement or compare their living conditions with ours. Remember in their eyes belongings are valuable and not just trash laying around. Using a layer of compassion and understanding when dealing with the occupants will lead to a more successful outcome. This care should be taken in non life threatening conditions to understand, explain, and support them. Treating them like a beloved family member is a great method of supporting their emotional needs. If you are mean spirited and use terms such as “trash house” or “hoarder” they can have severe reactions to yourself and crew, sometimes violent reactions. One example of this type of reaction occurred in Long Beach California as a code enforcement official showed up to a home to serve notice. The occupant shot the code enforcement officer in the head. This illustration should help us all understand how strong the compulsion to protect their belongings is. How threatened do you think a person would have to be in order to shoot a code enforcement officer? We all should keep this illustration in mind as we respond to hoarding conditions to ensure we all come home safe. Thanks for stopping by chamberofhoarders.com as we begin the year long journey of discovery…..
As always you can learn more about Hoarding in our online Learning Center… Click Here! When firefighters enter a burning building many different factors come into play. One huge factor that can affect the outcome of the operation is the presence of increased amounts of belongings, caused by a person afflicted with compulsive hoarding disorder. As their collection of stuff accumulates the danger in hoarding firefighting increases. Over the past two years of reaching out to fire departments from around the world some common challenges kept coming up. Inability to hit the seat of the fire, shielding from the heat , and difficulties in escape were top of the list. This past weekend the chamber of hoarders had a unique opportunity to enter a “live fire” environment to experience these variables. With the assistance of the Frontier Fire Company in Wheatfield New York a hoarding environment was set up and multiple scenarios were run. The results were a confirmation of all the research collected. Each variable was looked at individually and together with great success. It truly served as a reminder that hoarding changes our operations and if we are unwilling to adjust our operation it may not be successful. With many safety measures in place the fire rotations started with a firefighter between the stacks of belongings with a thermal imager. What we learned was a confirmation and an amazing result. While the other instructors took a beating from the heat in front of and behind the stacks of stuff the inside firefighters documented floor temperatures of 125 degrees with thermal imagining, shielded from the heat. Documenting these temperatures was an unofficial, non- scientific example of the true dangers of the hoarding environment. No monitors, measuring equipment, or recording devices were in place, just a group of firefighters with thermal imaging cameras watching something amazing. The hoard shielded the firefighter from the heat. It restricted the heat and pushed it past and around. These results proved a multiple amount of points. Victims can have more survivable thermal temperatures when insulated with hoarding. With the recent research on flow paths coming to light the need to adjust them for hoarding firefighting was revealed inside the burn room in New York this past weekend. It reconfirmed the dangers of the insulation provided by the interior conditions. This insulation can hide the hidden heat and dangers until it’s too late. Most firefighters advance into burning buildings using their senses to determine how far and deep they are to go. In hoarding conditions they may keep pushing unaware of the hidden dangers waiting for them. Dangers that could present themselves in the form of rollover, flashover, or backdraft, trapping the firefighters because they don’t have secondary means of egress. Confirmation that the shielding is real was not a surprising result. This weekend just reconfirmed what we have been learning from survival stories from around the world. Hoarding conditions can act as an insulator keeping high temperatures away from the victim or firefighter in the middle. We need to educate firefighters to be aware that this shielding can lead to poor judgment to just how far we should push. Identify, adjust, and attack when Hoarding is discovered!!!!!!! How much risk are you willing to take? While attending the 2013 Ohio Fire and EMS expo in Columbus Ohio last week it seemed clear that first responders don’t fully understand Hoarding Dangers and how they can affect safety. Having the opportunity to travel and meet the brave men and women who serve as first responders is a HUGE honor. In this past week’s travel is where this lack of understanding became crystal clear in these conversations.It’s like clockwork that when someone hears that I am studying responses in Hoarding Conditions they immediately start into a story of a response. These stories always involve the words “lucky” and/or “fortunately” something happened or it could have been bad. As an educator these words are like fingernails on a chalkboard. I would like to share two conversations that came from Ohio. Sharing these conversations is not a judgmental or an effort to “bash” anyone, but rather an attempt for everyone to learn from their experience. The most troubling story was, by far, the firefighter who described a fire where they had to crawl over piles and piles of belongings to fight the fire. They described hoarding at a level 3 and went on to explain that the interior firefighters had to crawl over multiple stacks of belongings to access the fire, which sounded rather small. The conversation described the difficulties of traversing the stacks and how “lucky” they were to make the fire room and have a successful firefight. With the hair standing up on the back of my neck I began to question them and after some time the “I never thought of that’s came”. Often we all don’t think of a certain danger until someone exposes us to it. Their response is common when dealing with hoarding conditions. Without being judgmental we should all be exposed to the danger possessed by the stacks of stuff. Let’s review some of the factors and why firefighters should not crawl over stacks of stuff and exactly how dangerous it is. Each of the above danger can place a firefighter in a life or death situation at a moment’s notice. Mix one with another and a recipe for disaster is on the horizon. Example: Firefighters making an interior push choose to crawl over a stack of glassware. The weight of each firefighter plus gear added to the instability of the stacks causes a collapse of the stack downward then adding a side collapse covering the firefighters with sharp glass. You can see the dangers in the above example. Not knowing what is in the piles of belongings should be the number one reason why we should NOT crawl over stacks of belongings. Adding the weight of a firefighter to an unstable situation can lead to a mayday. Do the occupants crawl over the stacks or walk around them? Occupants use the pathways to access the usable space inside the house and so should we. Using the “goat paths” for interior access is the safest way to gain interior access without collapsing piles of belongings on beneath the firefighters. Think about walking to the stage of a theater, would you crawl over the rows of seats or use the isle to access the stage. Another hoarding story from this trip was a assistance call where they described a Clean Hoarder Environment. This mindset is troubling because of the hidden dangers that may not be seen because of the accumulation of belongings. While the environment may look “clean” from the view point of a responder, do we truly know what lies beneath the hoard. Without access to walls, rooms, and the inability to see the floor do we truly know what’s underneath the stacks of stuff. The answer is NO. Stacks of belongings in the home can hide dangers for first responders. Rodents, insects, mold, and animal excrement’s can all be dangerous to responders and all can be hiding beneath stacks of stuff that appear to be clean. Without the ability to clean and maintain a home, due to the hoarding, the occupant may never truly have the ability to clean, sanitize, or remove problem areas. This accumulation can be dangerous for them and us. If you find a hoarding condition that must be entered we MUST assume the worse situation possible and choose to wear our PPE properly. Assuming that the hoarding area is “clean” is an assumption that can lead to Bio Hazard exposure. Once discovered we should take the appropriate precautions and choose to wear ALL of our PPE to make sure we don’t care these dangers home to our families. Emergencies in hoarding conditions should be identified, adjusted for, and then attacked with different approaches by all first responders. Crawling over debris and not choosing to wear proper PPE are just two dangers that could cause injury or death. Make the choice to avoid them both when, not if, you are called to enter the hording environment. Since the days of the Collyer Brothers, in Manhattan, first responders have been dealing with the excessive accumulation of belongings caused by compulsive hoarding disorder. We have just “dealt” with the challenges and continued on our way to solve the problem. Today we are seeing an abundance of these types of emergencies. 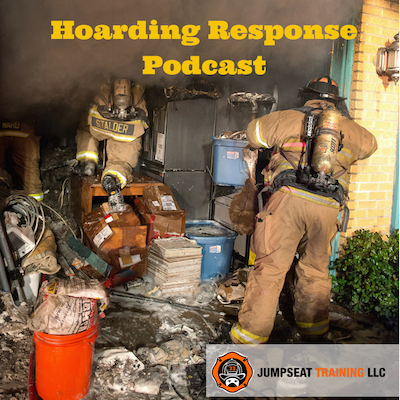 Many different theories exist on why we are seeing an increase in the number of compulsive hoarders, but without a doubt emergency responders are seeing an, almost, epidemic level of responses inside hoarding conditions. Compulsive Hoarding disorder is defined as: The accumulation of and failure to discard large amounts of belongings that have little or no value. This compulsive accumulation eventually takes over their home to where it cannot be used for its intended purpose. How does this disorder directly affect the first responders? As the accumulation of belongings start the dangers to the occupants and first responders big to pile up, just like the stacks of stuff. The challenging environment that follows offers challenges with entry, exit, and an increase in available fuel for a fire. Along with these challenges firs responders can be faced with multiple biological dangers caused from rodents, human, and animal waste. Each one of these dangers is major challenges for first responders. [caption id="attachment_158" align="alignright" width="180"] Photo Courtesy of Twin Cities Fire Wire. People that are afflicted with compulsive hoarding disorder are very reclusive and often do not allow people to enter their homes. Many of these folks feel “embarrassed” or “ashamed” as they are aware of how their disorder is seen by people. If no one is allowed to enter their home it is common for the first responders are often the first people to discover the conditions. They will keep to themselves until they have a medical emergency, fire, or experience a need to call 911. This call brings the local responders to the environment, often unprepared for what they find. What are the Cues and Clues that hoarding is Present? One of the most common questions asked: “Can you tell from the outside of a house that Hoarding conditions exist?” The answer is, YES. While it is not a 100% certainty there are some common ques and clues that can lead you to assume that the home is filled with belongings. Identifying these common clues will lead to a better informed decision making process and adjustments to keep responders safer. How often are these emergencies happening? It seems like every day another story of a hoarding emergency is being reported, somewhere in the world. These are just three examples in the past number of weeks.  How can the Chamber of Hoarders Learning Center Help? With training budgets shrinking faster than a sinking ship, we searched for an affordable alternative to offer our class to the fire-ems service. From these request the chamber of Hoarders Learning Center was born. It is a 24-7, 365, accessible, and affordable option for responders to sit through 4 plus hours of education. It can be viewed on mobile, desktop, tablet, or any device with internet access. Do you travel to present? Are you prepared to call a mayday, right now? One of the most often asked question from my students is how do you know when you should call a mayday. The answer always comes back to, anytime you can’t get yourself out or find yourself in need of assistance, PERIOD! There are many situations that require a firefighter calling the mayday and one that holds true is a firefighter who finds themselves inside the trenches of a Hoarder Home. Without knowing, an interior structural firefighter can find themselves with stacks of belongings that can extend up to ceiling level causing a huge problem in advancing hoses, searching for victims, and any other fire ground tasks. How far do you push into these conditions? At what point do you call a mayday? These are two questions that should be considered by the individual firefighter while using some common variables. Determining the level of belongings can alter an interior attack. Making this determination can be the challenge due to smoke conditions. Using the stream of your hose or an extended hand tool can give you an estimate of how high the stacks are. If you carry a 24-36 in haligan you could use it to sweep above your head to determine the height. If you choose this technique you will need to be mindful of the location of the other firefighters with you. Either choice of techniques should be used with caution as the resulting collapse could cover up unannounced victims, secondary means of egress, or uncover hidden pockets of fire. Most often the only part of the hoarder stacks that are burning are the top layer. By knocking over the stacks you could expose more fuel, maybe even more flammable fuels such as newspapers that were once insulated from the heat source. Whether it’s caused by your sweeping tool or just by itself falling debris should be considered when inside the hoarder environments. Often the pathways, or “goat paths” , that traverse the interior of the hoarding can be narrowed to a level that causes the advancing firefighter to knock stuff over, just by traveling through them. These two variables should be considered if you find yourself inside the hoarder environment. Both can cause an added level of danger to an interior firefighter. Often, hoarding conditions can NOT be identified from the exterior of a building. This can expose an interior firefighter to the dangers once they have passed the point of no return (5 feet inside a structure). If you find yourself in this condition take these two variables into consideration when determining how far you want to push inside. If you are experiencing ceiling level stuff or collapsing debris it might not be a fight that you want to take on. Even worse, if these conditions cause you to become disoriented, entangled or low on air make sure that you are ready to call the mayday and activate your pass alarm. It is better to call and cancel the mayday, than to find yourself in a collapsed stack of stuff and running out of air. If you’re in a mess, use your pass and make sure that hoarding doesn’t trap you inside without a way to escape a rapidly progressing fire condition! Welcome to the first video from the ChamberofHoarders.com. This short video is a look into the new exciting online learning that will be released soon! The Chamber of Hoarders Online Learning Center will be a 24/7 access to hoarding education for first responders. Keep up to date on the new online learning center by signing up for our email blasts. Click here to sign up. We hope you enjoy our first video. Without a doubt, the number one question asked is “How can I tell if the home is a Hoarder Home”. The answer: You will need to look for the Cues and Clues of Clutter. If you are driving your district, running medical emergencies, or driving home from work you should be on the lookout for the hoarded homes in your district. Knowing the conditions BEFORE a fire happens will make you better prepared when you arrive. How do you find a hoarder home? Let’s look and a new approach to identifying a clutter home in your district. These cues and clues should trigger a need for further investigation. If you suspect one or more of the above you should begin to investigate a little deeper, but how? Without an invitation or a need we cannot enter your property but the eye in the sky always knows. Taking to your computer and using tools such as Google earth can let you get a bird’s eye view of the property to confirm your suspicions. Find a point of interest, address, or something to give you a reference point and view the property from overhead. This perspective will allow you to view the backyard, side yard, and potentially the windows without physically walking the property. STATEN ISLAND , N.Y. -- City firefighters rescued 30 small dogs from a blaze that ignited in a two-story home -- apparently owned by a "hoarder" -- in the Clifton section of the borough. The call about a fire at 3 Bowen Street came in at 9:29 p.m. It was under control by 9:59 p.m., said an FDNY spokeswoman. "It looks like there was a Colliers' mansion condition in the house; that's what we call a hoarder's house," said an FDNY spokeswoman. Firefighters are battling fire at the home of a hoarder in Evendale. The fire broke out Friday around 1:30 pm at 3520 Glendale Milford Road. Crews from Evendale, Glendale and Springdale have been called to help fight the fire. Firefighters were forced to take up a defensive position when they could not get through the front door because of the hoarding. There are no reports of injuries. For the second time in 16 months, authorities are investigating hoarding at a Winter Street home. 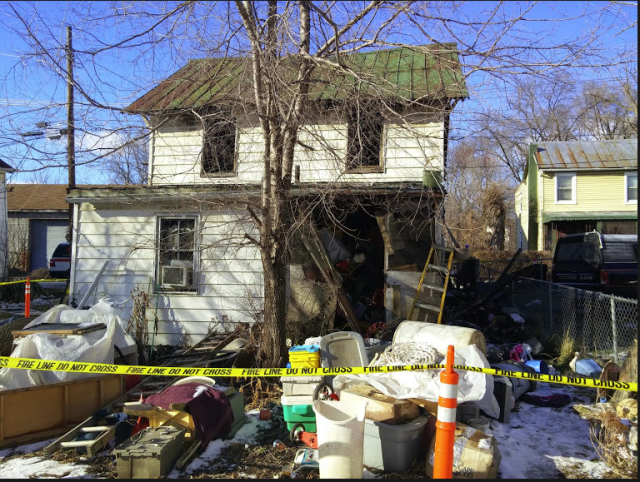 On Tuesday, the fire department went to 124 Winter St. for a medical call around 1:15 p.m. after the 83-year-old man who lived in the home was found on the ground outside, Deputy Fire Chief Anthony Pillarella said. "Inside of the home there was unhealthy conditions," the deputy chief said. Pillarella would not describe the conditions in the home, only to say, "They were bad enough that we called the Board of Health and the police." Because the man was not home when the Board of Health arrived, they could not enter the home without his permission, the deputy chief said. The man was taken to MetroWest Medical Center in Framingham to be evaluated and treated. A Framingham police crime scene photographer, wearing booties over his normal shoes, took photos inside the home. Hoarder Homes: If the Clutter don’t Kill You…..
After spending the last two days reviewing pages and pages of tragic events, which lead to a Line of Duty Death, searching for the effects of clutter, hoarding, or large amounts of debris. A huge point of learning kept coming up. It wasn't the clutter that killed the firefighter; it was the clutter that kept the firefighter from being able to escape the primary killer….a rapid fire event or collapse. This point of learning kept me up all night long trying to figure out how to share this information with all firefighters in a sensitive, yet stern way. The last thing that any of us should do is disrespect a fellow firefighter when learning how they died, but we all should honor them by learning the how’s and why’s. How’s and why’s constantly included these factors. While some had one, most had two or three of the above factors that contributed to the death of a firefighter. We can make adjustments for these factors, most of us do. But we need to make sure that we are adjusting for them ALL. One can be dangerous, but combine multiple factors together, and it is a firefighter killer. We need to take some steps to make sure we don’t underestimate our enemy, the fire. Using some common assessments during the firefight can give you a buffer of safety and keep you thinking about the potential for death. Keeping these tips and keeping your head will allow you to expect the unexpected, when dealing with the large amounts of clutter. Adjusting how we operate in a hoarding situation will allow us to search, attack, and overhaul the home safely. Make sure you Identify, adjust, and attack to make sure we all come home safe!!!!!! One question that keeps coming up, time and time again, when dealing with hoarder homes, is how do we keep the piles of belongings stable and prevent them from falling on us or the occupant. This is a challenging question with a multiple different answers, dependent on the situation. From fighting a fire to removing a patient on an ems run this challenge can be met head on to keep the stuff off of us. Let’s look at a few simple ways to keep the massive amount of belonging in their place while we perform our tasks. The most challenging part of fighting a fire in hoarder conditions is keeping the belongings in the same place. From a VEIS search to advancing a hoseline dealing with the stacks will be difficult. One way of stabilizing these piles is to avoid them at all costs. The clinical term used is “Goat Paths” and this is how the occupant accesses their home. By using these pathways will allow you to minimize the movement of the belongings, if the pathways are wide enough to allow. Enviably you will know some things over, but if you make an effort to keep the hose low on the stacks and crawl toward the bottom of the pile you can help prevent a collapse. While staying low will not be an end all, cure all it will use the base to keep them in place. Another benefit in staying low is to avoid the heat that you will be exposed to if you choose to go over the piles of belongings. Every 12 or so inches equals 100 degrees and with some hoarding conditions that means a 200 degree spike. If you can’t stay low you may be creative in your thought process. Bringing an attic ladder, or two, or a salvage cover can offer you a tool to help keep the stuff in place. If you choose an attic ladder, try to place it at waist level, when standing, to stabilize the middle of the pile. This will be a labor intensive task and you will need to pay close attention to your air supply. Often times there will not be enough space to lay it flat, so you will need to angle it upward to the ceiling level to capture as much surface area as possible. Choosing a salvage cover will also be challenging. Pre-rigging it for a quick and sometimes not complete deployment will be needed. If fire conditions allow you can carry it inside and deploy it over the pile. The cover will need to have some weight to it, not the lighter weight blue style. During this process you may need to knock over some of the pile to help stabilize it. When choosing this method a thermal imagining camera and due diligence is needed to make sure you are NOT exposing the firefighters or cover to high heat conditions. One pressing problem with hoarding is accessing the exterior of the home. From collections in the back yard to side yard full of belongings gaining access can be a hazardous. Using some of the above mentioned tactics can be used, but also using ground ladders to stabilize the outside belongings may also be used. Laying it on top, to the side, or a combination of both can be used to make pathways of access. Removing of privacy fencing of other barriers may be necessary to make this achievable due to the fact that they often use them to “Hide” their hoard. You may also choose to use a salvage cover in combination with grounds ladders to make a stable environment as well. Much like a ladder chute, to collect water, you can use two ladders and a salvage cover to make pile of belongings more stable to walk around, or worst case, climb over. Climbing over these massive amounts of material can be challenging even with chutes and ladders to help offer stability. From stabilizing the piles to maneuvering around them entering a hoarded environment offers man challenges. Taking the time to stabilize the pile will allow you a greater level of safety as your exit routes will stay clearer. One thing needs to be remembered when crawling in, your way out may become blocked, no matter how hard you try. Using the paths to fight a fire or access a patient is a “best practice” when dealing with hoarding. Getting creative and using some technical rescue skills will also allow you to enter and exit safely. Remember that unless you practice these you WILL NOT be proficient at them. Add some of these recommendations to your next drill and see if you can stabilize the stacks……..
Hoarder Home: If you see something, say something! Welcome back into the chamber of hoarders. After some time away we are back and well into summer preparing emergency responders to face the challenges of compulsive hoarding disorder environments. This week we are going to look back at a training topic that we have visited before, with a new twist. It is vitally important to allow firefighters to communicate their findings on each response; this is even truer when faced with massive amounts of clutter found inside hoarder homes. From pulling on scene to making a interior attack, each and every firefighter should be taught what to say, who to say it too, and how to say it when a hoarding environment is suspected. Example, “ interior to command we are experiencing Heavy Content”, “command received.” Often this is where this line of communication ends, not allowing incoming units or firefighters that didn’t receive this message aware of the potential for danger. It’s time for us to change how we process, receive, and announce situations. Being the eyes and ears of the responders is a role that each firefighter should be given. Constantly scanning, evaluating, and searching for potential dangers should be trained on until they become automatic. During this training is where we should introduce them to cues and clues that a hoarding situation is present. If you encounter any of these situations a message should be transmitted to command. Announcing the presence of hoarding conditions will put everyone in a more defensive mindset and allow the commander to call for additional resources. Extra manpower, more apparatus, and needed rehab sector are all areas that need reinforced when dealing with hoarder conditions. If the IC doesn’t know they need them, why would they call for them? Make the call, even if you are wrong. If they are not needed they can be released and returned to service. Being in command of a fire when the announcement of heavy contents is made requires some direct actions. First action is to communicate the findings to the dispatch center to share the message with everyone responding and on scene. Second action is to call for more help. With hoarding conditions firefighters air consumption will be greater, thus lowering their work time and will need a longer rehab period because of the stresses placed on them while working in these overloaded spaces. Knowing this a commander should request additional units to respond to the scene. Third action should be a second rapid intervention team. If a firefighter is inside and experiences a Mayday, it will require a larger number of firefighters to access and remove them. A good rule of thumb for any commander is the rule of doubles. If you discover hoarding double the number of firefighters, RIT team members, and double the rehab time allowing your firefighters to adequately recover from the larger workload. The worst thing that you could do is place your firefighters into a stressful environment and not allow them time to recover before going back. If you hear something, Dispatch Something! If you allow your firefighters to make the announcement of a potential hoarding situation it will allow all commanders to use the rule of doubles and call for the help needed. Hoarding can place us all at a greater risk do to the compression of belongings that has taken years to accumulate. Make the adjustments if you are faced with these conditions and make sure we all go home! On Saturday May 11,2013 Jumpseat Training brought a new level of training to the West Virginia Public Safety Expo in Charleston WV. Expanding their wildly popular classroom session, Hoarder Home's Piles of Hazards for Firefighters, to include a hands on session. Evolution's within simulated Hoarding conditions added a new level of learning and perspective to the class. This was the first time for "hands on" evolution on Hoarder Fire Training. Allowing students to experience the challenges faced with hoarding conditions took the learning to the next level. When firefighters are faced with hoarding conditions they must change how they operate to remain oriented to their location and adjust how the search inside these conditions. Look for more hands on training from Jumpseat Training Soon!